Pete & Carol have lived next door to the property 30+years. Carol grew up right up the road and the home they live in, next door to the cottage, was her Grandparents. With growing up and living in the area for so long we know how enjoyable it is to be here. We have a private property and enjoy living here. The historic area around us has so much to see and enjoy. Whether you enjoy nature, hiking, kayaking, boating, shopping, farmer's markets, the Amish, or relaxing you will have the opportunity for it all. So close to the Susquehanna River to be able to use it or the hiking trails around it. If you want to travel to a big city, we are centrally located to Philadelphia, Baltimore, Washington DC, or New York City. But, you will enjoy the city of Lancaster and Columbia for their arts and antiques. Powder room on the first floor. Main bath on second floor with a tiled shower. All towels and washcloths provided. Our cottage is located in the scenic area of Ironville. You may see deer during your stay right outside the door. Well equipped with all needed to make a meal. Dish towels and cloths provided. Paper towels, dish soap, and dishwasher detergent provided. We had great time staying at this beautiful cottage. The house was very clean, quiet, and beautifully furnished. We especially enjoyed screened porch and professional kitchen, and our dog enjoyed running around in fenced yard and meeting farm animals! Thank you, Carol and Pete! We will be back! We had such an amazing time! Pictures did not do it justice! Carol and Pete are the most hospitable hosts you will find. They took into consideration that we are Vegan and made us a breakfast bake that was so delicious! They were available to answer any questions! The house was so neat, beautiful and more than what we expected! The kitchen has any and everything you could possibly need! We will definitely be staying again! Beautiful screened in porch as well as a grill! The farm animals were a delight. Our dogs really enjoyed meeting them! Thanks again Pete and Carol! Nestled on a little farm, this cozy cottage is the perfect romantic getaway. Hosts, Carol and Pete will make you feel right at home. From the homemade scones and farm fresh eggs to the flowers on the table — no detail was overlooked. The cottage itself boasts lovely decor and a gourmet kitchen. 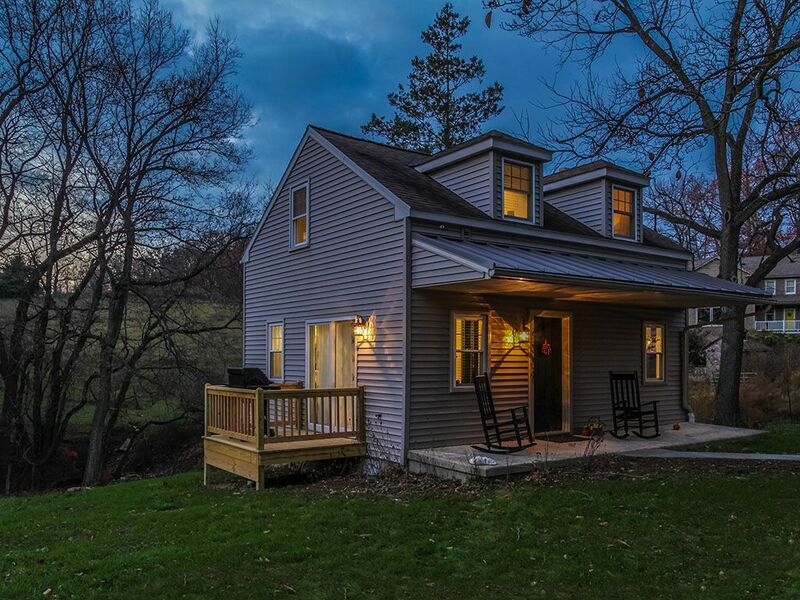 Easily accessible to Lancaster and Hershey, it’s a quiet retreat where you can curl up beside the fireplace, feed the donkeys or just take in the quiet beauty of the surroundings. We had a wonderful time with daily greetings from the two donkeys, all the chickens. The cottage had everything that we needed. It was so comfortable, quiet, quaint with a beautiful kitchen. Carol said the cottage we stayed in was the tenant house on the farm before they renovated. Our dog Jude loved it too. We Loved, Loved our stay. Thank you Carol and Pete. What a beautiful home to stay in. Our stay here was very enjoyable. The owners do an amazing job of making you feel at home. Carol was an incredible host, she went out of her way to make us feel welcome. Greeting us upon arrival with homemade scones fresh out of the oven! The house had such charm and was filled with lots of lovely touches. It was super clean, the bed was very comfortable, the bathroom and shower was excellent and the kitchen was very well stocked with everything you could possibly need. We found it to be beautifully furnished with great attention to detail and excellent value for money. We espceially enjoyed the added feature of the outside screened in area, allowing us to totally enjoy our morning coffees and evening night caps as well as watching the animals on the farm. We would highly recommend this incredible home. Thank you Carol for letting us share your wonderful piece of paradise. We will definitely be back again next year! The cottage is located near the beautiful Susquehanna River. You may enjoy spending time on the river or hike a trail near it. If you enjoy shopping, the Amish, or just relaxing this will be a treat for you. Centrally located to Philadelphia, Baltimore, Washington DC, or New York City for day trips if so desired.